In the course of researching another topic, I recently happened across Doug Yurchey’s essay “The Nature of Black Holes and Quasars,”1 which is posted here at World Mysteries.com. Although this article is generally well-written (there are, however, several stylistic faults present), the statements by Mr. Yurchey seem to indicate that he has misinterpreted some of the fundamental concepts of classical physics in addition to several facets of quantum mechanics. The purpose of this essay is to clarify these misconceptions and then to show that Mr. Yurchey’s conclusions are, in fact, not supported by the body of evidence relating to these two natural phenomena. While it will be necessary to expand upon these definitions during the course of this reply, they will serve our immediate purpose. We can now turn our attention to where it appears that Mr. Yurchey appears to misunderstand the established scientific facts concerning both black holes and quasars. The laws of physics are universal, constant, and understandable. The fact that our understanding of these laws may be incomplete in no way implies that each region of the universe has laws that are not found in other regions. For example Newton’s Law of Universal Gravitation applies to the gravity that holds us to the surface of planet Earth as well as to the gravity that governs the motion of the entire galaxy or even clusters of galaxies. The same principle applies to his hypothetical light beam analogy. According to the Theory of Special Relativity if you were riding on a single photon of light (your “inertial frame of reference”) time would pass at exactly the same rate as if you were standing still, you would still be subject to the laws of nature, and light would have the same velocity relative to you. To an outside observer things would be radically different but, relative to you, things would be the same as if you were not moving at all. The laws of physics, particularly the laws of gravity and conservation of momentum, are perfectly preserved in and near black holes. In order to appreciate the significance of this, we must first understand the weakest force in the universe: gravity. The distortion of space-time caused by a concentration of mass. When the mass of an object is expressed as a function of the volume that the object occupies, we can state that the object has a certain density. The larger the amount of mass present, the higher the object’s density.6 It is obvious that the denser the object the greater its distortion of its local space-time and the deeper the “gravity well” that it produces. The process which produces a black hole is beyond the scope of this reply and those readers interested in this topic should consult one of the many print or online resources devoted to this topic. For current purposes it will be sufficient to say that in a black hole the density of its core is so high that it produces a gravity well with “walls” so “steep” that not even light, traveling at 186,000 miles per second, has enough velocity to escape. In other words, any object falling into a black hole can never escape but this does not mean that it has violated any known law of physics. In his essay Mr. Yurchey reproduces an apparently-unanswered e-mail from himself to Leonard Susskind, a physicist at Stanford University7, in which he claims that the phenomena known as quasars are actually the “opposite ends” of black holes. In doing so he seems to have again misinterpreted the available observational and theoretical data. Mr. Yurchey’s statement “The info-matter-energy through a Black Hole leaves our universe...and comes out another universe” is simply incorrect. According to the laws of gravity and quantum physics, any matter falling into a black hole is compressed by gravity into what is known as a singularity, an area whose density approaches infinity but does not reach that “magical” number. It does not, as Mr. Yurchey claims, go anywhere. It remains within our universe, although undetectable, and thus does not violate the Law of Conservation of Matter as Mr. Yurchey alleges. As to the state of matter comprising the singularity, this question remains unresolved. In support of his claim that quasars are the location at which matter eventually emerges from a black hole, he argues that there is no other possible explanation for the tremendous amounts of energy known to be associated with quasars. Once again, he is incorrect and again misunderstands the abundant evidence to the contrary. Artist’s conception of a black hole. The accretion disk is represented by the multicolored swirls surrounding the light-colored center. The structure seen emerging at a right angle to the central disc represents charged particles trapped in the black hole’s electromagnetic field (Credit: NASA/Goddard Space Flight Center). One again Mr. Yurchey seems to have either misunderstood or ignored the principles of high school mathematics. A simple exercise will demonstrate his error. The object in Figure 3 is indeed a quasar known as 3C273. It also has the distinction of being the first quasar to be discovered (in 1963) and, even at a distance of around 2.2 billion light years,13 is so bright that it can be observed with a backyard telescope. But at that distance not even the Hubble Space Telescope or its successor, the James Web Space Telescope, would be able to detect a solar system! Furthermore, the “dots” in the above images (which Mr. Yurchey claims to be planets and solar systems), would have to be several light years in diameter to even appear in the image since the jet itself is 100,000 light years in length (our home galaxy, the Milky Way, is estimated to be 100,000 light years across). Since a solar system, by definition, consists of a star and at least one planet orbiting at some distance from that star, it follows that solar systems are over 99% empty space. Now, let’s take a look at what other observations of 3C273 have shown. (Left) False-color image denoting areas of mass concentrations. (Right) False-color image demonstrating the intensity of electromagnetic radiation at various regions within the jet originating from 3C273. A composite, false-color, image of the same jet as above utilizing data from the Hubble Space Telescope (HST); the Very Large Array radiotelescope (VLA); the Chandra X-ray Observatory, and the Spitzer Infrared Observatory. Blue denotes areas producing x-rays; green is for optical light, and red is for infrared emission. The image has been rotated for editorial purposes. (Credit: Yale University). of the resulting force vector. (Credit: Wikipedia Foundation). Mr. Yurchey’s resort to “light beam saucers” as “proof” of his “theory” only serves to demonstrate the extent of his misinterpretation of established scientific principles. If Mr. Yurchey would produce some evidence that such vehicles actually exist it might enhance his credibility. This essay has attempted to call attention to several misconceptions that are central to Mr. Yurchey’s hypothesis regarding both black holes and quasars. While there is no doubt that he is sincere in his beliefs his supporting “evidence” is, at best, tenuous there can be no questioning of his zealotry. Unfortunately, in his haste to inform the world of his discovery, he has committed so many errors in reasoning that it would not be improper to question whether errors are due to a willful disregard of the available evidence. Since the previously discussed errors and/or omissions are central to Mr. Yurchey’s thesis, the thesis itself cannot support itself and should be dismissed as untenable. 1. Yurchey, Doug (2006): “The Nature of Black Holes and Quasars.” Available at http://www.world-mysteries.com/doug_bhquasars.htm, accessed June 14, 2007. 2. Goddard Spaceflight Center (2002): NASA’s Imagine the Universe Q & A. Available at http://imagine.gsfc.nasa.gov/docs/ask_astro/quasar.html, accessed June 14, 2007. There have been several names given to the phenomena that we will describe as quasars. 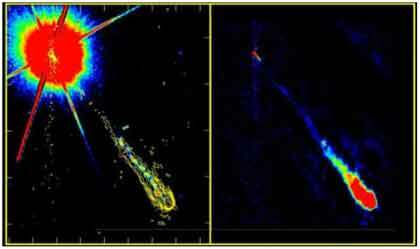 These include radio galaxies, active galactic nuclei, and QSO (Quasi-stellar Object). Regardless of the names used, the underlying physical mechanism is powered by a black hole of almost unbelievable mass. 5. For a more detailed explanation of gravity, I strongly recommend Gravity by the late eminent physicist George Gamow. It can usually be found at the larger book retailers, such as Barnes & Noble or Borders, as part of an anthology of his works. It is a thorough treatment of the subject yet easily understandable. 6. Mathematically, D = m/v where D is the density of an object per unit volume; m is the amount of mass present, and v is the object’s volume. 7. Reproduced in paragraphs 7-14. 8. Fulvio Melia (2007). The Galactic Supermassive Black Hole, Princeton University Press. 9. 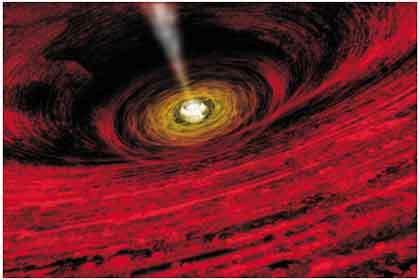 The 13 billion-year figure was announced on June 7, 2007 and is based on observations made using the Canada-France-Hawaii Telescope at Mauna Loa, Hawaii and the Gemini South Telescope in Chile. The press release and links to related topics can be found at http://www.cfht.hawaii.edu/News/Quasars07/. 10. Technically, visible light is but small part of the electromagnetic spectrum, which itself runs from very low energies (radio waves) to ultra-high energies (x- and gamma-rays). Higher temperatures are invariably associated with higher-energy photons. 12. Uncredited image, Yurchey ibid. 13. “3C273” is translated as “object number 273 in the Third Cambridge Catalog of Radio Sources, the standard reference used by both optical and radioastronomers. The 2.2 billion light year figure is from the same source. 14. The reader is again referred to any number of high school-level textbooks of mathematics or physics for a more in-depth discussion or, alternatively, consult the Wikipedia article concerning the derivation of the right hand rule. 15. Paragraphs 26 & 27.